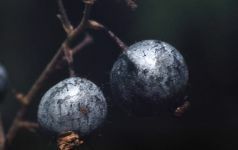 Decumbent or spreading shrubs, usually under 1 m. tall, the young branches finely puberulent, becoming reddish-brown. 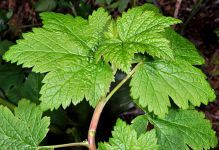 Leaves alternate, long-petiolate, the blades palmately veined, deeply cordate, 4-8 cm. broad and long, glabrous above, with short-stalked, non-crystalline glands below, 5-lobed half their length, the segments ovate-triangular and serrate with rounded teeth. 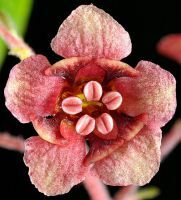 Inflorescence 8- to 18-flowered, erect to ascending, racemose, shorter than the leaves, puberulent, and with reddish, stalked glands throughout; pedicels up to 1 cm. 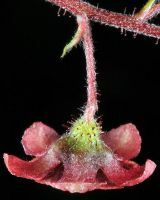 long, jointed just below the ovary; calyx tube shallowly bowl-shaped, 1 mm. 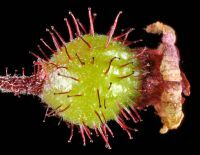 long, lined with a thick, flat, 5-lobed reddish disk that covers the top of the ovary; 5 calyx lobes 2.5-3 mm. 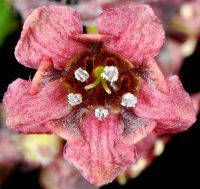 long, deltoid-ovate, spreading, greenish-white, with a pinkish to purplish tinge; petals purplish-red, 1.0-1.5 mm. 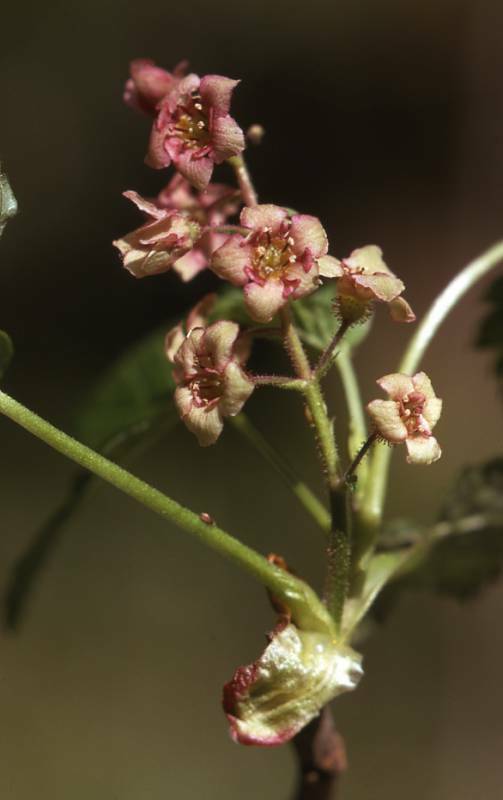 long and broad, reniform, clawed; stamens 5, equaling the petals; styles glabrous, united half their length. 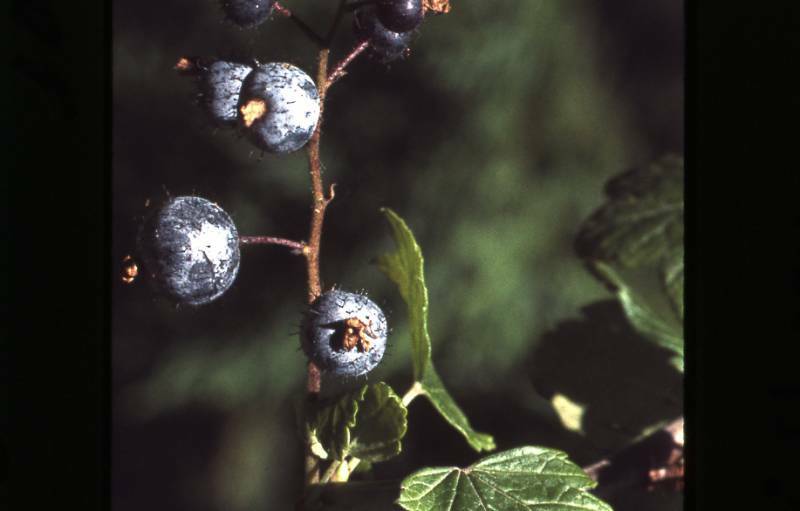 Berry glaucous, purplish-black, ovoid, 1 cm. long, glandular-bristly. 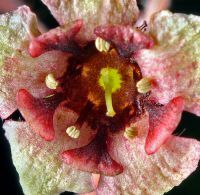 Filaments of R. laxiflorum are reddish. Publication: Fl. Amer. Sept. 2: 731. 1813. 1813. 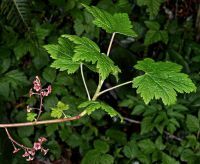 PNW Herbaria: Specimen records of Ribes laxiflorum in the Consortium of Pacific Northwest Herbaria database. 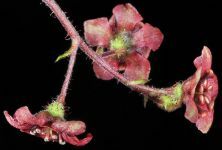 WA Flora Checklist: Ribes laxiflorum checklist entry. 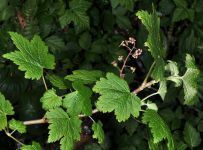 E-Flora BC: Ribes laxiflorum atlas page. 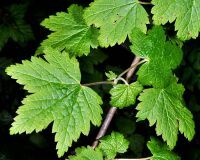 USDA Plants: Ribes laxiflorum information.